Rolls of steel stacked inside the China Steel Corporation, Taiwan – the kind of exports that could be hit by recent tariffs. Tension, angst and mistrust pervade today’s global trade landscape. The multilateral trading system that has governed the international flow of commerce over the past 70 years is being tested in ways that threaten its relevance and continued existence. Most striking of all, the United States, the traditional guardian of the system, is the one shaking things up. Through raising tariffs, blocking the appointment of new judges on the World Trade Organization’s (WTO) appellate body and asking countries to “manage” trade by buying more and exporting less, the Trump administration has made it clear it’s not business as usual. Some say that we just need to get through this administration and then things will get back to normal. With a new White House, they contend, the US will get back in the trade game –and that the admittedly imperfect rules-based system as embodied in the WTO will continue to prevail. They are misreading the situation. The system, created in the aftermath of the Second World War with the General Agreement on Tariffs and Trade (GATT) – which was succeeded by the WTO in 1995 – has done wonders in expanding worldwide economic prosperity and opportunity, lifting millions out of poverty and contributing to global stability. But over time it has faced serious and growing challenges that are now reaching a head. In short, the rules haven’t kept up with important global developments, such as the emergence of new major trading countries, advances in technology and the proliferation of new types of trade barriers. The last global round of trade negotiations concluded 25 years ago, and, since then the WTO has chalked up few negotiating successes. The bilateral and group deals that have followed have made some important inroads but haven’t successfully dealt with these challenges. Moreover, a growing number of citizens around the world feel disenfranchised by this system, which they hold largely responsible for growing income inequality and the loss of well-paying jobs. While this sentiment is most acutely felt in parts of the US and Europe, it’s only a matter of time before it takes hold in other countries. Traditionally, the US has been looked to for leadership in moments like this. The Trump administration, however, couldn’t be clearer that it is not interested in playing that role. We are now at a juncture where a fresh look at the current trading system is warranted and overdue. Reforms are needed if the rules-based trading system is to remain viable and relevant. The magnitude of such change remains an open question. The Trump team advocates a fundamental overhaul and rebalancing of the system; others prefer adjustments on the margin, leaving the current system largely intact. Is there a third path that can get the trading system back on track while putting trade wars on the back burner? And if so, what would that path look like? Here are five suggestions for a third path, all offered in the spirit of capturing the benefits of trade and maintaining a rules-based system while addressing the plethora of concerns expressed on many sides of this debate. 1. Shape rules for state-led economies. 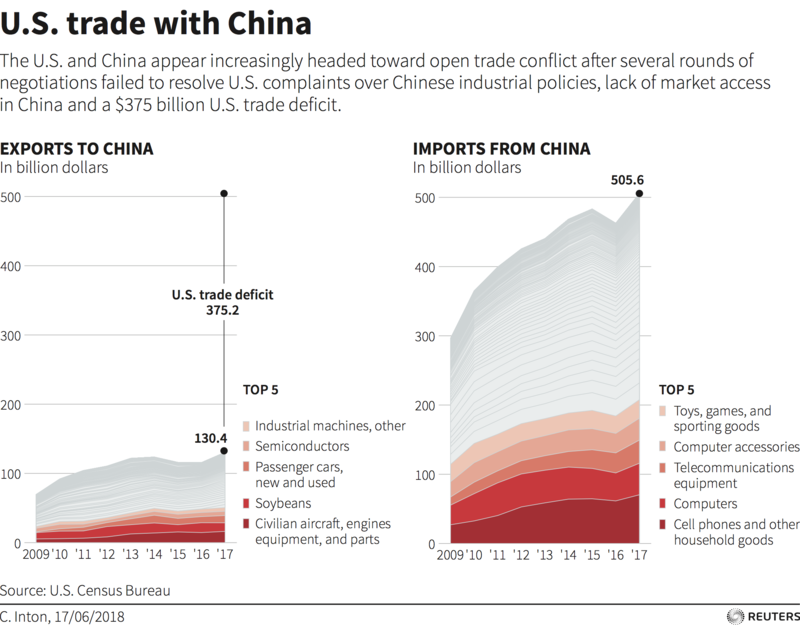 The current US-China trade dispute has highlighted that rather than converging, the economic systems of the two largest economies in the world are growing further apart in many respects. It’s time to accept this reality and develop a co-existence pact. Instead of pushing for the dismantling of China’s state-led economic system, negotiations should focus on ensuring that the enterprises, products and services of state-led economies don’t distort international trade and don’t harm others in the system. This involves establishing more detailed disciplines in such areas as industrial subsidies and other financial assistance, the operation of state-owned enterprises and overcapacity. The EU, Japan and the US made a good start in identifying a way forward on these issues in their May Joint Statement. Their paper should serve as a basis for working with China and other key trading partners to urgently develop new rules in these areas. 2. Look to the future. Trade negotiators have an uncanny way of focusing on the sectors and industries of yesterday. As e-commerce was taking off in the early 2000s, WTO negotiators were busy working on reducing tariffs on manufactured goods and agricultural subsidies. Bilateral and regional free-trade agreements have done a better job in keeping up with technological advancements. We are on the cusp of the Fourth Industrial Revolution with technological advancements moving quickly, bringing disruptions with them, and the trading system finds itself challenged to keep up this breathtaking pace. Now is the time for trade negotiators to shift the focus away from the more traditional sectors and grapple with the rules needed to govern trade for the Fourth Industrial Revolution. Emerging technologies, such as additive manufacturing, robotics, new types of vehicles and artificial intelligence will call into question many of the basic tenets of the current rules-based system. These include the traditional distinction between goods and services found in most trade agreements, the rules for determining the origin of a product, and the emergence of competing standards. The WTO should task a group of senior trade experts to offer concrete recommendations on updating and rethinking trade rules so as to make them relevant to and effective for these new technologies. That could serve as a good start for negotiations in this critical area, before national policies are put into place, making international compromise more difficult. 3. Opt out of the most-favored nation (MFN) obligation. This is the rule that requires the outcomes of a trade negotiation to be applied to all economies regardless of their participation. MFN was agreed to in the post-war period, when countries wanted to promote maximum trade liberalization and prevent the world from retreating into separate trade blocs. The key exception to the MFN obligation are free-trade agreements that cover “substantially all trade.” It is not waived, however, for deals that focus on a single sector or part of one’s economy. While MFN may have made sense in the past, it’s hard to defend today and it actually hinders new market-opening “plurilateral” initiatives. Why agree to open one’s market and be obligated to extend the benefits to even those who keep their market closed? With the ability to opt out of MFN, sector-specific agreements in areas like the automotive industry, medical technology and environmental technologies may be given a shot in the arm, knowing that participants would not be expected to offer the benefits to “free riders”. 4. Reform the WTO’s dispute settlement system. An immediate challenge facing the WTO is the viability of its dispute settlement system, particularly in light of the US blocking the appointment of new appellate body judges. With caseloads for the appellate body skyrocketing and fewer judges to hear cases, we are approaching a perfect storm. The US’s main concern is that the appellate body has exceeded its mandate of reviewing the decisions of WTO panels by reinterpreting the pact’s actual obligations. But to the frustration of many, the US, while full of criticisms, has not offered alternative proposals to reform the system. It’s time for the US to do so, as well as for others to work constructively to reform these procedures. Without an effective dispute settlement system, countries will be increasingly encouraged to take matters into their own hands. 5. Convene joint meetings of the WTO and International Labor Organization (ILO). For the rules-based trading system to remain viable, it needs to do a better job of addressing the concerns of those who feel they are on the losing side. Dealing with workforce issues will become increasingly important to countries around the world, regardless of size and economic structure. It will help stave off calls for protectionism. An international conversation could be an important step in identifying promising initiatives for individual governments to consider. Regular meetings between the WTO and ILO would allow member countries to share their experiences on worker training, educating their workforce for the next generation of jobs, and effective social safety net programmes to help those left behind. With tariff wars front and centre, the world’s attention is now focused on trade. The rules-based system is under attack. Walking away or making a few minor reforms on the margin is a tempting response. However, both responses would be short-sighted. The best course is for countries to work on impactful, relevant and inclusive initiatives that will fix these problems, reflect the realities of today rather the 1940s, and propel the system into the next century. Can the WTO still change the rules of trade?